In August I attended the annual pilgrimage to the Heart Mountain Internment Camp near Cody, Wyoming. I have wanted to visit all ten of the infamous camps since my serendipitous encounter with the Topaz camp near Delta, Utah in 2012. Heart Mountain and Tule Lake in northern California have been at the top of the list since they have full flown interpretative centers and some buildings from seventy years ago still stand. Tule Lake had the jail for the hard cases from all the camps so I have to see that one. By hard cases I mean men who refused on principle to sign loyalty oaths to the country that imprisoned them. I was waffling on the Heart Mountain trip till I learned about the August pilgrimage. That made it a no-brainer. Still I wasn’t sure how appropriate it would be for a non-Japanese to attend an event like this. But when I queried the camp’s executive director, Brian Liesinger, he replied that, “It’s absolutely appropriate.” And so it was. As I have already expressed, the participants in the pilgrimage were as impressive a group as I have ever seen. That's ever. From the elderly former internees, a waning number to be sure, to their great grandchildren these were energetic, warm, accomplished people to a person. And somehow those qualities underscore how tragic and indefensible the incarceration of 110,000 Japanese-Americans actually was. The ineffable spirit and grace of the former internees was palpable. I am, frankly, in awe of it. At the opening dinner on Friday I was seated with Ron Akin, a Veterans Affairs Commissioner in Wyoming, a liberal in the Cowboy State no less, along with two former internees from Heart Mountain including one James Iso from Roseville, California. 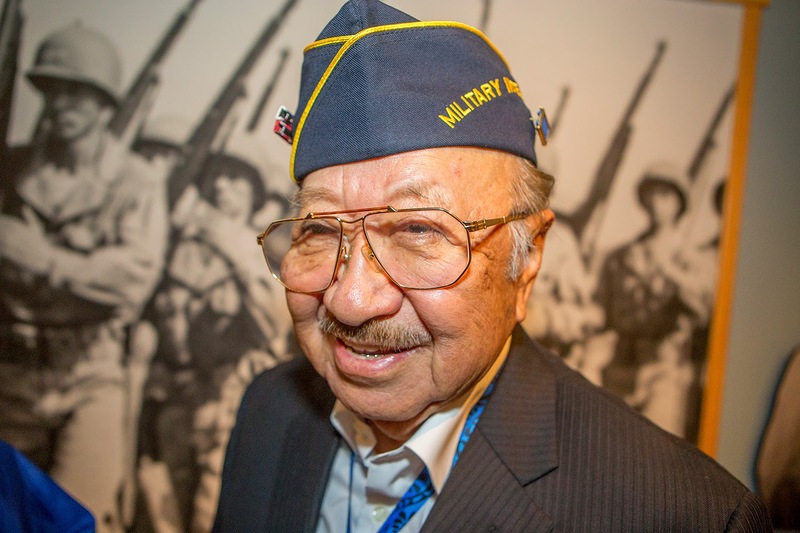 During the evening’s presentation I overheard Ron tell someone that Mr. Iso had served in all three wars. I took that to mean WWll, Korea and Viet Nam and I was more than a little incredulous. 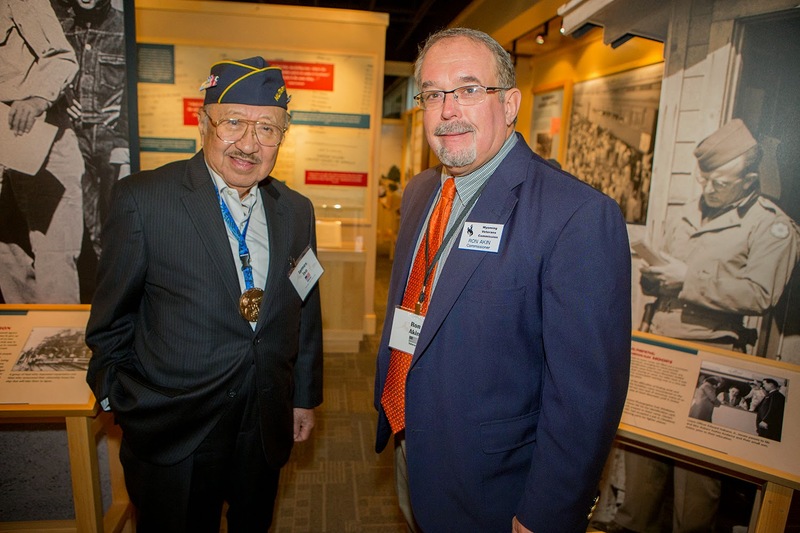 Then during the group visit to the interpretive center Saturday morning I met James Iso. Our brief conversation went something like this. He answered, “Yes it is, not always in the military but always in uniform.” His response was tantalizingly cryptic. You can channel your inner Graham Greene with this nugget. James Iso and Ron Akin. Ron is probably fifty give or take. I couldn't resist the side by side. Bacon Sakatani, age 84, with James Iso. Bacon had more energy than the forty year olds in the group. He served in Korea. Mr. Iso went on to say, “You know we shortened the war by two years. 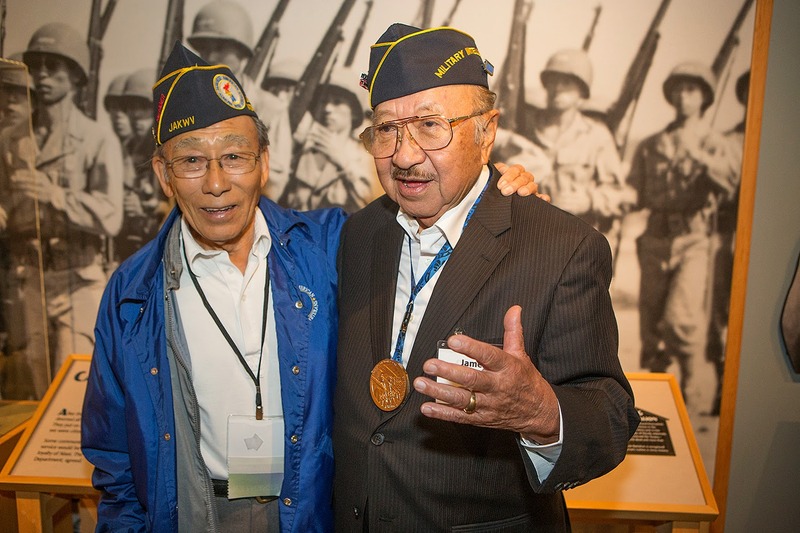 Everybody knows about the 442nd Regimental Combat Team,” he said a little wistfully, “but they don't know that 6,000 of us served in Military Intelligence. We translated Japanese communications, broke their codes and planted misleading information. We won the Battle of the Philippine Sea and destroyed most of their carrier based aircraft because we had intercepted their plans for attacks in the Central Pacific." I thought to myself that this was a story begging to be told and dangled the idea of writing it. He did not bite. As our conversation wound down I asked him how old he was. He said, “Guess.” I really didn’t want to guess but the math added up to old. He said, “I’m ninety.” I'm not buying it. There must be a book in this. That is must with a capital "M". Now I am thinking that given the current immigration situation with the massive detention center in Eloy, Arizona, the two stories are merging over time and space. The Eloy center is privately run by the Corrections Corporation of America, whatever that says about our nation at this point in time. And a piece on National Public Radio Weekend Edition gave us a piece of the puzzle we had not heard before. 1/8th of the so-called illegal immigrants in this country are Asian. Left to the mainstream news, you would think all the so-called illegals are from Mexico, and central and South America. Are you channeling your inner Graham Greene? I'd channel it if it was in there. Our immigration situation is appalling, of course There's no humanity in it though the President's recent action is progress however temporary. Prisons run my private corporations for profit make my retch. Thanks as always. If you didn't comment I'd have zilch. I really thought this one would get some attention.